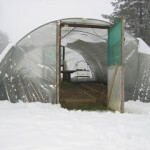 If you’re undecided about whether to buy a polytunnel then I can’t recommend it (or a greenhouse) enough, and especially for any fair weather gardeners….. it was 20ºC in ours at lunchtime today! 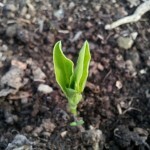 It basically means you can start sowing seeds a bit earlier. Some may still need the protection of horticultural fleece or newspaper for the more tender varieties but it will give you a head start. If you plan well (and want to) it will enable you to grow a variety of veggies all year-long. 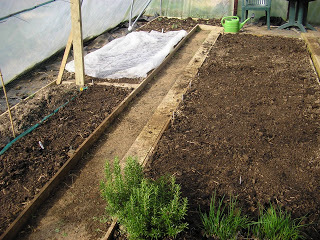 I had a couple of hours to spare today so having covered the soil in well-rotted manure a few months ago, after a rake over and water we were finally able to sow some seeds into our tunnel. These included mangetout, dwarf french beans, lettuce and basil (under fleece at night), beetroot, perpetual spinach and scallions. We also moved a few strawberry plants growing outside into the corner of the tunnel in hope of an earlier crop. All being well, in a month or two we’ll be planting courgettes, squash, cherry tomatoes and peppers and after we’ve harvested the beans and peas, some winter cabbage. 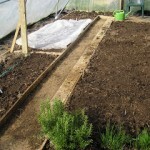 It feels great to get started again and am now chomping at the bit to get the rest of the beds ready outside. 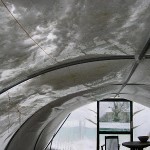 Warning: Brush Snow Off Your Polytunnel to Prevent Collapse.